When in Tokyo, you’ll find that locals visit the best hidden spots for their fix of ramen, tempura, and tonkatsu. 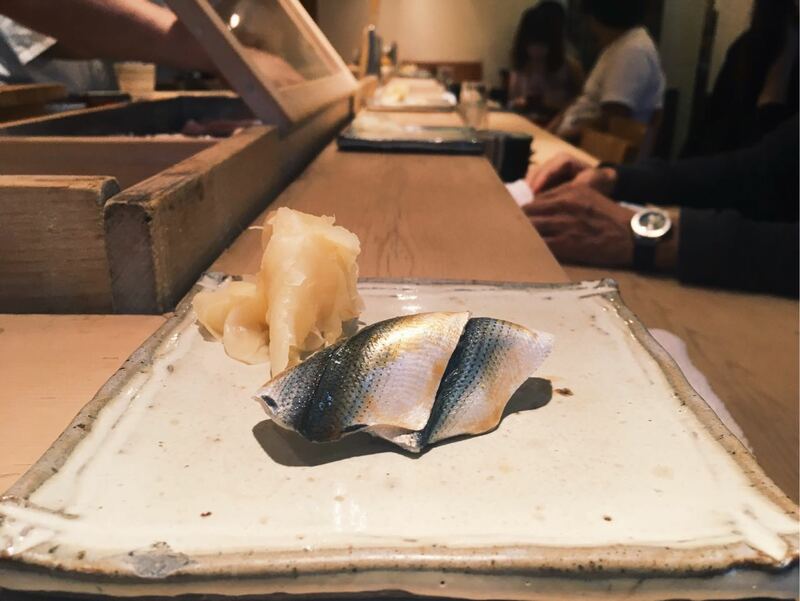 The iconic sushi omakase is no different. Umegaoka Sushi is still my favorite no-frills sushi joint but Sushi Matsue is the more refined spot. Indeed, Tokyo’s sushi scene is filled with industry big names like Sushi Jiro and Sushi Sawada. But if you’re visiting for just a short trip without reservations months ahead, Sushi Matsue epitomizes why visiting local gems are just as worthy and charming. A 5 minute walk from Ebisu Station, Sushi Matsue is a quaint L-shaped sushi bar with a lunch omakase menu at 6000yen (~60USD). The omakase comes with sashimi, grilled fish, and an incredible amount of sushi. Sweet abalone with octopus–delicacies that are rare treats even in Tokyo! I visited Sushi Matsue with my friend Mizuha and was pleasantly surprised at how easy-going the talented chefs were. The restaurant was filled with a light and comfortable chatter our entire meal. My knowledge of seafood in Japanese is still a work in progress, so conversing with the chefs when they served each piece of sushi was like a fun puzzle. Sushi Matsue’s lunch sets are a steal at 6000yen, with dinner at a still reasonable 11000yen. Highlights of the meal definitely included the sweetly glazed abalone and nori-wrapped grilled scallop. In terms of sushi, the uni was incredibly creamy and the tamagokyaki was just divine. If you’ve watched Jiro Dreams of Sushi, then you’ll understand my appreciation for a good piece of egg custard. With impeccable sushi at a reasonable price point, Sushi Matsue is definitely on my list of Tokyo favorites. A worthy lunch spot for visitors and locals alike! It was really a super amazing lunch. Definitely try to visit next time you’re in Japan! Thanks for stopping by.